The line has been drawn. Now prepare yourself for combat against Iron Man in this Captain America: Civil War Deluxe Winter Soldier Child Costume. 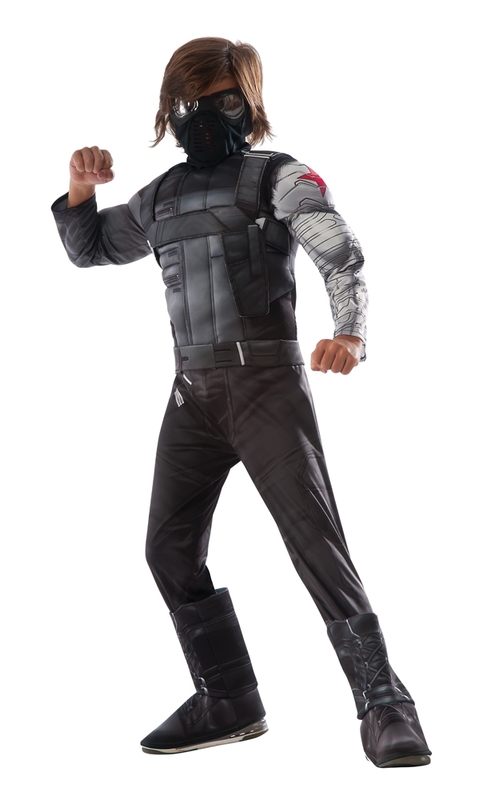 The deluxe winter soldier child costume includes a jumpsuit with attached boot tops, belt, and mask. The jumpsuit features padded muscles and a velcro closure on back. It features printed armor detail and sewn on straps. The printed metal arm is detailed with a red star. The black belt is secured and fastened by velcro. The Winter Soldier mask covers the lower half of the face. It features tinted soft plastic lenses, a mesh front, and fastens with velcro on back. Assemble your team this Halloween and Comic Con for cosplay fun.